Complete your living space in memorable style. Our Amish American Mission Large End Table is handcrafted in the heart of Pennsylvania Amish country just for your home. Choose reliable furniture that lasts and shop less. Your new end table is made to order in oak, cherry, quartersawn white oak, or brown maple. Customize with your choice of our wide array of stain options. Design the end table of your dreams, built to last a lifetime. 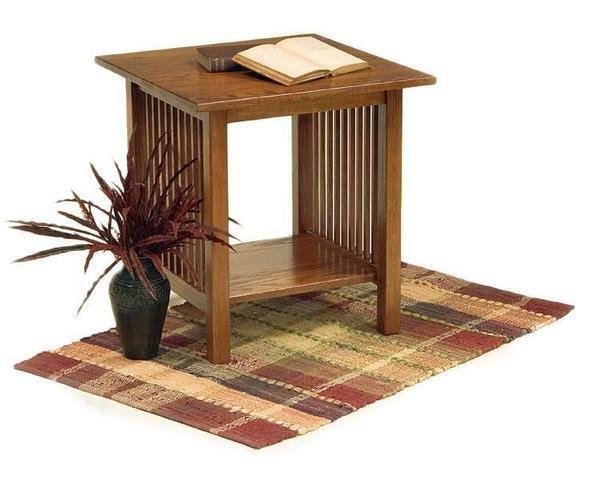 Consider our American Mission Magazine Rack End Table as another beautiful and functional addition to your living space. Should you have any questions about our American made furniture, pelase feel free to give us a call at 866-272-6773. Thank you for shopping with us! Hi Valerie , I ordered furniture from DutchCrafters last January... And was waiting for just a few last touches before I sent along pictures to you. I just wanted to let you know I have never been so pleased with a furniture purchase before. Not only was the help and service wonderful but the final product is simply beautiful. The color and finish and attention to detail is amazing. I love every single piece that I picked out!!!! If you are tired of spending money on poor quality furniture, this is your place to shop! We just received our TV Stand and end tables and are thrilled with the quality! Our craftsman, Samuel did an excellent job! It you cannot afford Cherry wood, get it anyway! Unbelievably beautiful.